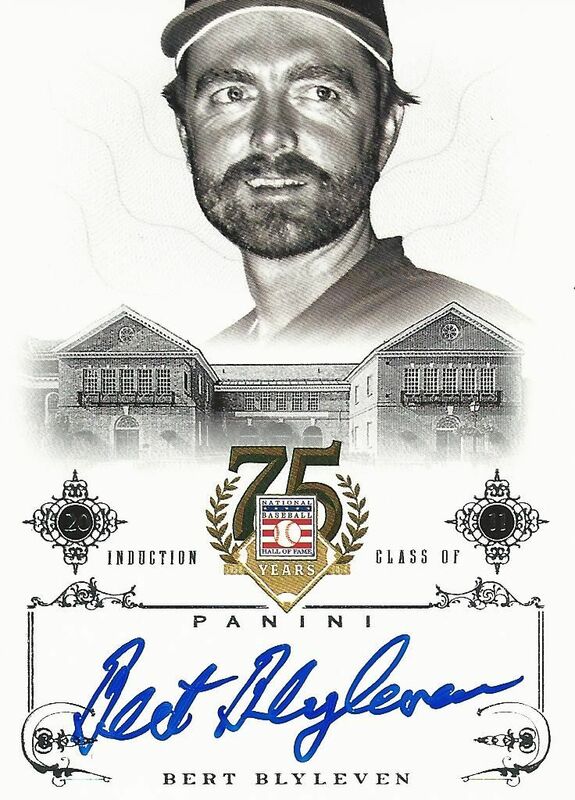 Panini celebrates 75 years of the Baseball Hall of Fame with a very special baseball release. This one-pack-per-box offering gives the baseball HoFers the royal treatment with a premium set of classy looking cards. Though Panini still doesn't hold an official MLB license, they seem to still make great looking sets like this one. When you open up the pack of Panini HoF you'll find a few all-foil cards. The cards are very shiny and depict players in the Baseball Hall of Fame. Each card is serial numbered and is adorned with both holofoil and standard foil. The overall design has a picture of the player within a plaque-like border with elegantly designed accents around it. 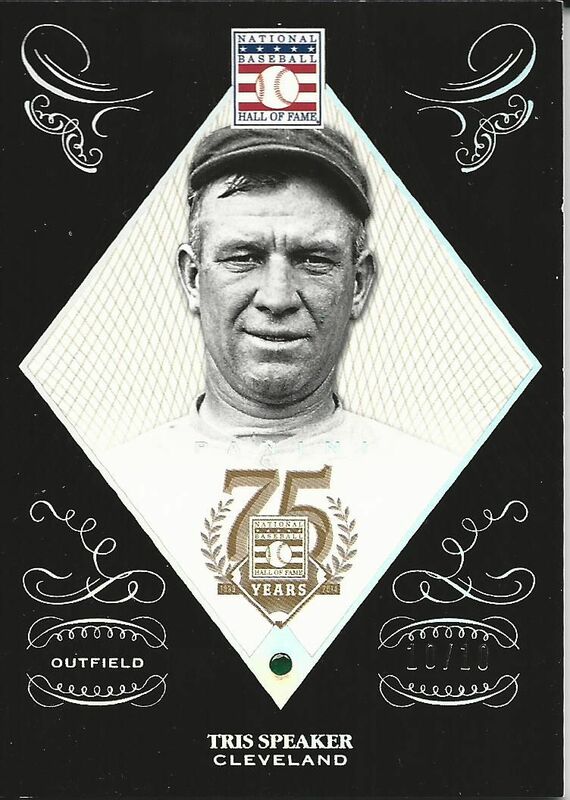 Though the cards are not on the super-thick card stock like the Immaculate or National Treasures brands, these cards still have a very premium feel to them. Each card is limited to 75 or less copies. It's a very short-printed set! 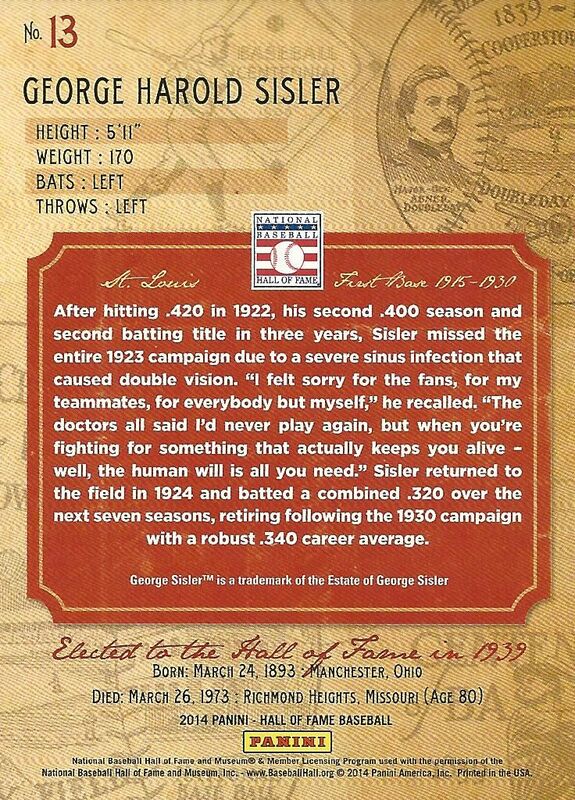 The card backs give a good amount of information about the player and have an 'old feel' to them. 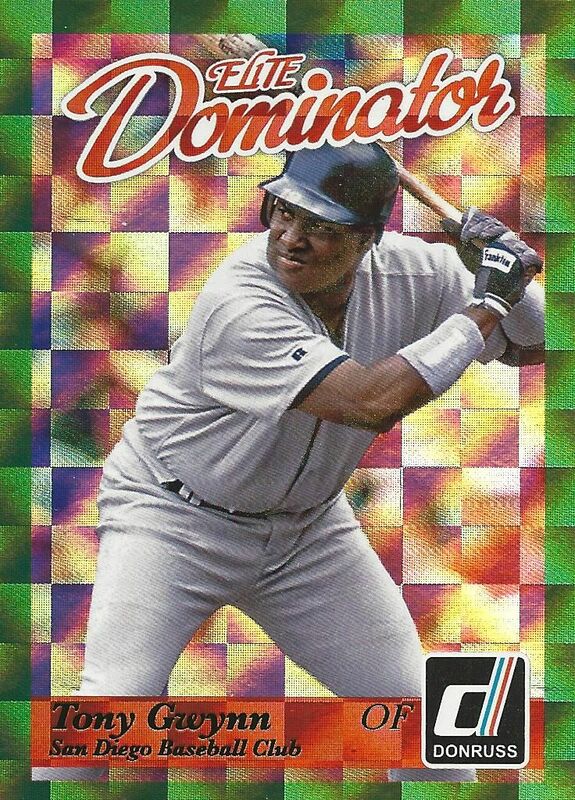 The backs use a color scheme that harkens back to a card produced many years ago. So even though the foil fronts are very modern, the backs of these cards provide a more vintage feel. I personally like the dual nature that they invoke. 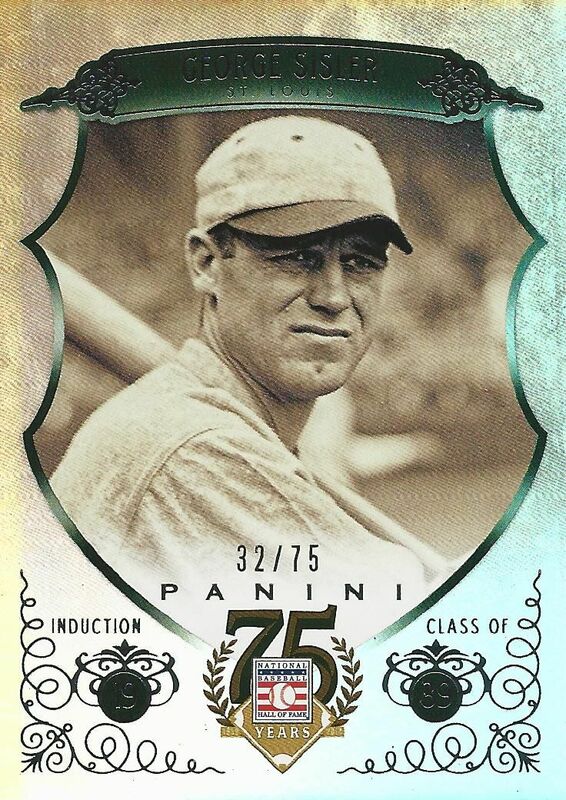 Panini has done a nice job of blending both an older and a more modern sensibility into one card. Each pack of HoF Baseball will contain a few limited base cards, a couple autographs, a smattering of inserts, and if you're lucky... a gemstone card! Collectors that have enjoyed Donruss through the years will like the fact that Diamond King cards have been placed into this set. The Diamond Kings carry a similar design to the standard base cards in that the same plaque-like border is used. But that's where the similarities end. The Diamond Kings come on a matte cardstock that gives the card a painting-like feel. The Diamond Kings come in a variety of different color variations. My pack contained the standard white-bordered version shown above along with a red parallel numbered to 75 and a blue numbered to 50. Crusade cards have also snuck into this HoF set. 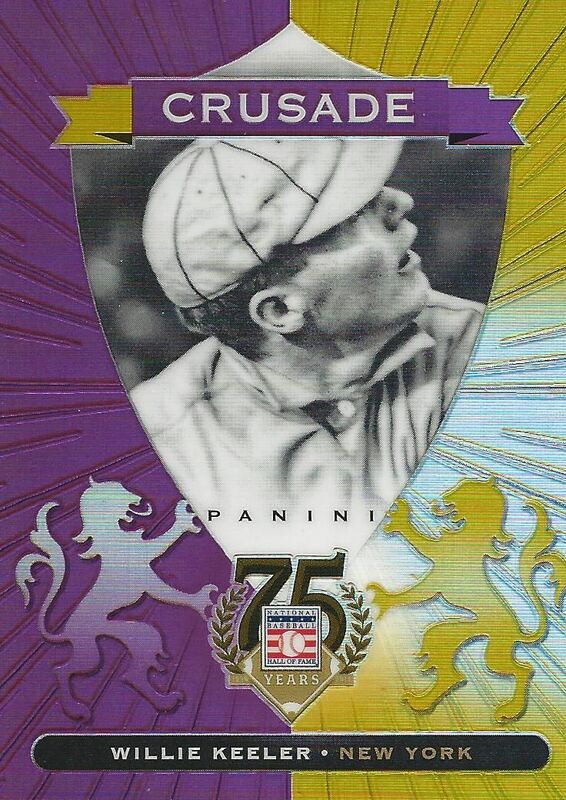 Crusade cards have been popular in Panini basketball and football products. They have a chrome look to them and come in a variety of colors. I guess the theme for this set is different parallels as there seems to be a parallel for every card! The Crusade cards have their fans, but to me they seem a little out of place in this set. Elite Dominators are back. I really enjoyed these cards in Donruss Series 1 and 2 so I'm fine with them showing up here as well. They have the exact same design as the ones from Donruss earlier this year. I suppose it could be a challenge to try to find all the Elite Dominators that have been released by Panini this year. It would be a fabulous looking set. 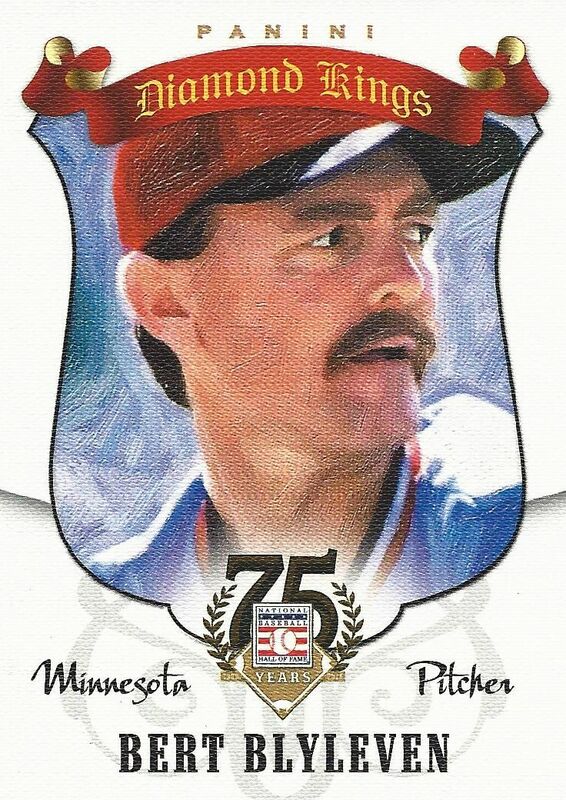 The Elite Series also pops into HoF baseball. Like the Dominators, I like this set quite a bit because of nostalgic reasons. 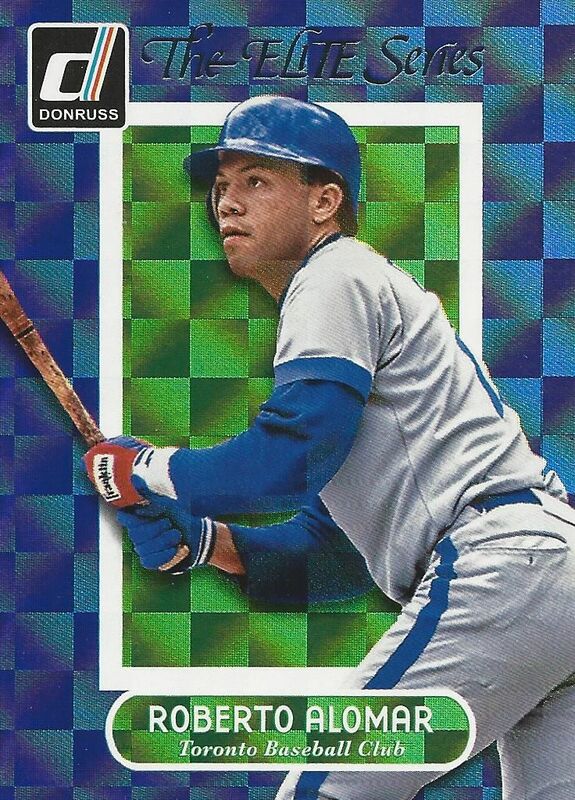 It was exciting to see Roberto Alomar depicted as a Blue Jay. I remember cheering on the Jays back in their World Series winning days. The main draw of HoF Baseball has got to be the autographs you can find in the set. And Panini did these right. The autographed cards look amazing. They are simple, yet classy and classic looking. I love the HoF building used on the card. The elements of these autographed cards is perfectly done. I'm sure many collectors will enjoy these autos. They are done so well that I don't even miss the team logos. Though there are on-card versions of the autographed cards like the Blyleven, some autographs do come on sticker like this red parallel numbered to 50 of Monte Irvin. Some boxes of HoF baseball will contain a special gemstone card. I was lucky enough to find an emerald card in this box. The gemstone cards are very thick and come with dark black borders to highlight the stone. It's definitely a cool looking and sweet card to find in a pack. Gemstone cards have slowly been released more and more by Panini in recent years. So far they have been a hit to collectors. This particular card is the first time I've ever pulled on, and I have to say it was pretty special to get. 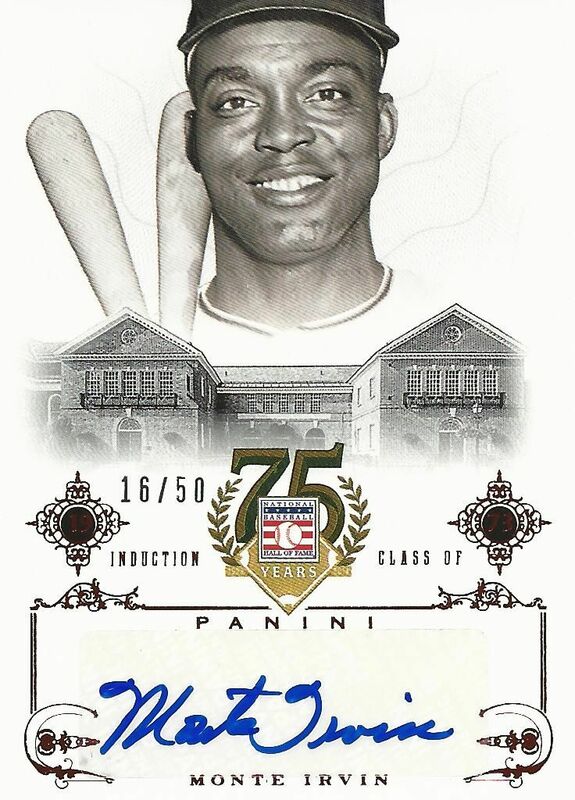 This Panini HoF Baseball product is a winner. How can you go wrong with a great looking set of Hall of Fame players? You can't! The cards have been well thought out and designed. Each box will cost a bit over a hundred dollars, but if you get a gem card, it is worth it. I really enjoyed opening this product, and I would definitely consider trying to find more of these cards to add to my collection. Panini has got a good one here. Really nice cards considering they don't have a license for baseball. I'm usually not a fan of one pack boxes however you get numerous numbered inserts so the product looks good to me. Awesome review! Those card designs are amazing. I don't know a lot about Baseball cards, bit that would be nice to have one in my collection ! Nice emerald ! Emerald card is real nice. Awesome box! The autographed cards look very nice! + Very classy looking autograph cards, especially the on card-autos. Panini are doing a great job, even without the MLB license. - The Elite and Crusades cards feels a bit misplaced in this product. Thought the review was really comprehensive and that emerald was really nice!